A Comparative Look at Hate Crime in Russia and the U.S. In recent years, as an important issue in foreign relations between the United States and Russia, the United States has focused on bringing attention to what it asserts is an inordinately high number of hate crimes in Russia. The US also claims that Russian authorities downplay hate crimes committed in Russia as minor criminal offenses and thus effectively discourage victims from reporting crimes. This protester at Pride, 2007 punched a gay activist in the face in full view of police. No charges were filed in the incident. The situations involving Luzhkov and Allen demonstrate that intolerance and xenophobia are still at least partially institutionalized in Russia and the United States. This will have to be addressed in order to combat occurrences of hate crime. Russia needs to create strong legislation to punish perpetrators of hate crimes, and both countries must work on better enforcing legislation. Among Russian government officials and community leaders, there is much disagreement about how define “hate crime” and in particular, how to define it apart from “hooliganism,” which is roughly the Russian equivalent to a misdemeanor public disturbance charge in the US. However, “hooliganism” is much more vaguely defined in Russia and can refer to anything from vandalism to a minor assault. It is frequently used by Russian authorities to define and prosecute a range of crimes. It is exactly these types of acts, committed as a result of a “low level of culture” that are frequently termed “hooliganism.” Not only does this create difficulties in collecting statistics on hate crimes, but the reluctance to clearly define “hate crime” but also creates difficulties in prosecuting and combating these offenses. Hate crimes are officially defined in US legislation as crimes that are “motivated by prejudice based on the actual or perceived race, color, religion, national origin, gender, sexual orientation, gender identity, or disability of the victim.” However, in order to prosecute this offense, the motivation of the crime must be proven, which is nearly always much more difficult than simply proving that the crime was committed by the defendant. This is not the only challenge to prosecuting hate crimes in the US. For example, according the FBI’s 2005 Hate Crimes Report, 5190 hate crimes were committed directly against someone’s person (compared to 3109 hate crimes involving damage to or destruction of property) and almost half of these were classified as “intimidations.” Because nearly any phrase or act can be used as an “intimidation” based on rhetorical context or inflection, prosecution and punishment of these crimes must always be determined on an individual basis. While the most common types of reported hate crimes in the United States are verbal threats and vandalism, reported hate crimes in Russia are usually physical attacks. In Russia, these seem seem to be becoming more violent and more prevalent. In March 2007, the Moscow Times reported that since the beginning of that year at least 15 people had been killed in Russia as victims of hate crimes – three times the number for the same time period in 2006. In addition, the Moscow Times reported that 67 people had been injured in hate crimes, up from the 47 during January and February in 2006. According to Galina Kozhevnikova of the Sova Center, attacks since 2006 have also shown signs of increased violence, including the use of firearms. In an interview with Andrei Nesterov, who now works for the School of Russian and Asian Studies, Kozhevnikova also asserted that attacks are most common in major cities such as Moscow and St. Petersburg. For instance, she stated that 213 individuals were injured and 36 killed in Moscow, and 51 individuals were injured and 5 killed in St. Petersburg in 2006, according to her statistics. Kozhevnikova stated that attacks most commonly occur in the subway systems or on commuter trains because perpetrators are able escape more easily after committing the crime. Attackers also favor locations where victims can be forced into empty lots or deserted areas. According to Kozhevnikova, this type of attack frequently occurs in St. Petersburg, which abounds in enclosed courtyards. Individuals of Caucasian and Central Asian decent are the group most often targeted, but are also unlikely to report the crimes to law enforcement officials if they are in Russia illegally, which is not uncommon. Other groups that are targeted are people of African and Asian decent. According to Kozhevnikova, statistics for hate crimes committed against foreign students are unreliable because university officials often try to conceal attacks in order to maintain the universities’ reputations. In the US, statistics regarding hate crimes have been collected since 1990, when the Hate Crime Statistics Act was enacted. This law required the United States Attorney General to create guidelines and work with Federal Bureau of Investigation and the individual states to collect data regarding hate crimes as defined in legislation. However, it was only in September 1994 that Congress amended the Omnibus Crime Control and Safe Streets Act of 1968 in order to make hate crimes illegal and prosecutable as such via the Violent Crime Control and Law Enforcement Act of 1994. This law was also the first to add physical and mental disabilities as possible motivating factors for hate crimes. Other legislation currently active in the US includes the Hate Crimes Sentencing Enhancement Act of 1994, which defines “three-level sentencing guidelines” to complement regulations created by the states and thus increase penalties for those who commit hate crimes. The Church Arson Prevention Act of 1996 and the Hate Crimes Prevention Act of 1999 further increased federal jurisdiction over the enforcement of hate crime laws and the prosecution of hate crimes with expanded resources and funding. Despite the amount of legislation, resources, and funding, statistical reporting is problematic in the US. First, the most recent statistics available are from 2005. The FBI and Department of Justice have yet to publish the 2006 Hate Crimes Report. The Anti-Defamation League in the US has also charged that the 2005 Hate Crimes Report is misleading because several cities and states did not participate. For example, no data was presented for New York City or Phoenix, two of the ten largest cities in the United States. Hawaii did not participate in the data collection program, and Mississippi and Alabama, where race relations have been historically strained and where hate crime rates might be expected to be high, reported no crimes at all. 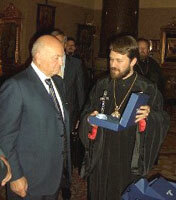 Moscow Mayor Yuri Luzhkov meets with an Orthodox Church official. Both the Mayor and Church are accused of fostering intolerance in Russia society. Figures reported in another report, Hate Crimes Reported by Victims and Police, compiled by the Bureau of Justice Statistics and released in November of 2005, may also indicate that the numbers reported by the FBI are inaccurate. If both the 1992 Hate Crimes Statistics Report from the FBI and 2005 report from the Bureau of Justice Statistics are correct, then hate crimes in the United States rose a surprising 19 to 31 times in the period from 1992-2005 – to a grand total of 191,000. The Bureau of Justice Statistics based their report on several years of raw survey data from the biannual National Crime Victimization Survey, which directly polls victims of crimes and considered by many crime experts to be more accurate than the system used by the FBI. The FBI uses the Uniform Crime Reporting(UCR) program, which collects and compiles statistical reports from local and state law enforcement agencies. Although more agencies now participate in the UCR program than when it was started in 1990, involvement remains voluntary and irregular. It is also widely acknowledged that hate crimes in the US, as in Russia, are under reported due to immigration issues. Hispanics are a targeted group in the US. According to FBI statistics, in 2005, Hispanics accounted for 7.3% of all hate crime victims. Furthermore, based on a population survey conducted by the Pew Hispanic Center in March 2005, there were 11.1 million illegal immigrants living in the United States at that time, the majority of which are Hispanic. It can be safely assumed that at least some of these illegal immigrants have been the victims of hate crimes and have declined to report them for fear of deportation. The Russian Criminal Code contains several articles which can be interpreted to relate to the concept hate crimes, although the actual concept itself is not defined within Russian legislation. Article 282 forbids “incitement to hatred [or] dissemination of racist ideas” and Article 282(2) defines penalties for organizations found to be “extremist.” Article 105 specifically forbids “murder motivated by national, racial, or religious hatred” and Article 357 is designed to prevent the crime of genocide. Article 244 specifically forbids “destruction of places of burial,” which can be an attack based on religion. However, several of these offenses can also be classed as “hooliganism” and the perpetrators rarely receive any meaningful punishment. For example, in January 2005, two teenagers were arrested for desecrating ten tombs in the Donskoye Muslim cemetery in Moscow. The perpetrators were charged with hooliganism, but subsequently released without prosecution under this charge or the more serious charge defined by Article 244. Effective prevention of hate crimes will also likely remain difficult in both countries so long as public leaders such as Mayor Yuri Luzhkov and Senator George Allen continue to make intolerant statements and thus perpetuate the ideology that motivates hate crimes. Russia faces the further challenge of an apparently growing problem, with no legislation to define, prevent, or even create official statistics to combat the problem. There is currently no known draft bills or proposed laws in Russia dedicated to this purpose. Meanwhile, the US Congress has attempted to pass other hate crime-related legislation within the last five years. Most of the bills have died in Congressional committees, but more bills are still being introduced. As a foreign policy issue, the US is justified in pointing out the high numbers of hate crimes occurring in Russia and the lack of legislation and enforcement to prevent these crimes. With the specific goals of helping Russia improve its image abroad, its demographic situation, and to bring justice to the victims of intolerance in Russia, Russia must be pressured to improve its record on this issue. However, problems surrounding hate crimes and intolerance exist in both countries and the US should not lose sight of this in its domestic policy assessments either. The author of this analysis, Brianne Todd, holds a BA in Political Science from The University of Notre Dame. She has previously served an internship with the US Embassy in Moscow and conducted independent research into the subject of community policing in Russia. She wrote the following article at the request of SRAS while in Russia over the spring semester of 2007, where she focused her studies on the Russian language.